Contact us to enquire for the skis on the Racer Deal! For FIS racers and competitive racers on Indoor and Dryslope. New Race Department-developed Powerdrive technology. World Cup titanal sandwich construction. Do you qualify for the Racer Deal? Depending on your FIS or BASS points you could qualify for the racer deal, meaning you can purchase your skis and bindings for fantastic prices. 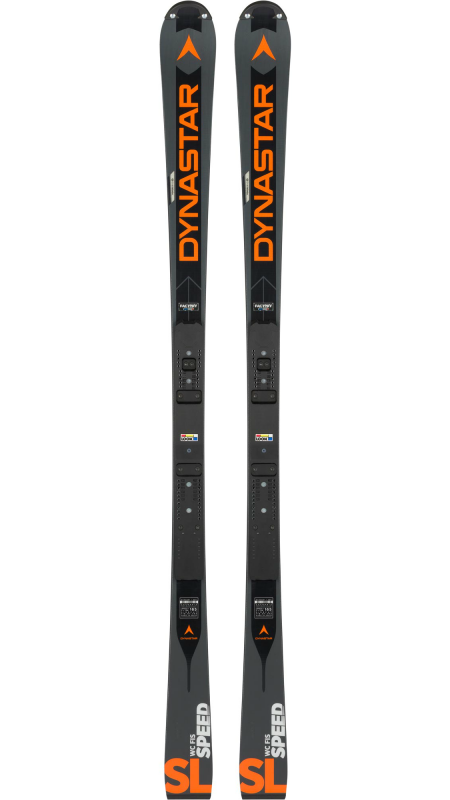 The Dynastar Speed WC FIS SL R22 2019 is the F.I.S. approved, World Cup slalom ski designed for elite-level athletes and competitive racers. The World Cup titanal sandwich construction and new R22 plate supply optimum precision, balance and power; race-room developed, Powerdrive technology unlocks the skis’ natural flex for smooth, dynamic power, edge grip, and the most responsive ski control on snow. New sizes comply with current F.I.S. regulations. Sizes available: 157cm- Ladies (for FIS) 12m Radius, 165cm – Males (for FIS) 13m Radius, size 157 is also a great ski for stronger male racers on Indoor snow and Dryslope. If the size you require is not available please contact us and we can order them in for you! For ladies skiers and less strong male skiers we recomend the LOOK SPX 12. For male skiers and very techincally strong ladies we recomend the LOOK SPX 15. If you are not sure, consult your coach about what is right for you or your son/daughter. A wood core and fiberglass laminate construction optimises snow feel, balance, precision, power and stability without the additional weight of metal laminates.